A group of 68 Sri Lankans who recently arrived at Cocos (Keeling) Islands is now on Christmas Island about to begin enhanced screening processes and those who are screened out will be returned to Colombo as soon as possible, the Australian government said. They face the same assessment process that unauthorised maritime arrivals (UMAs) of Sri Lankan background have since last year when the Department of Immigration and Citizenship (DIAC) took steps to stem a significant upsurge in boat arrivals from Sri Lanka, Australian Department of Immigration and Citizenship said issuing a statement. “Those who are screened out will be returned to Colombo as soon as possible, often within days,” a DIAC spokesman said today. “If any of the group is screened in, they will not come to Australia for assessment; they will be among the first Sri Lankan boat arrivals sent to Papua New Guinea for processing. Boat People arriving. Getty Images. The Sri Lankans began their enhanced screening as arrangements were finalised for the first transfer of people affected by the post-July 19 regional settlement arrangement to Manus Island in Papua New Guinea. Under new rules announced on July 19, anyone – including a person from Sri Lanka – who arrives in Australia by boat without a visa no longer has the chance to settle in Australia. “If they are not quickly returned to Colombo, they will be taken to Papua New Guinea where their claims will be assessed,” the spokesman said. The prime ministers of Australia and Papua New Guinea signed the new agreement, meaning all people arriving by boat without a visa from July 19 will be sent to Papua New Guinea, where their claims will be assessed. If people are found to be refugees, they will be permanently settled in Papua New Guinea – not Australia. “The message this agreement sends is clear: the dangerous boat journey is not worth it and you will never settle in Australia,” the spokesman said. 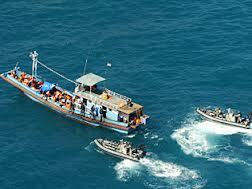 Almost 1300 Sri Lankans have been sent home since August 2012 – nearly 1100 of them involuntarily.